We believe that adding a little ‘off-the-wall thinking’ to our approach, helps us reach an intelligent, original solution quicker and more economically than ploughing conventionally ‘safe’ furrows. We approach each job by wearing what we like to call “our hat on sideways.” In other words, looking at things from a very different perspective firstly, before committing to the production route required. We like to encourage you as a client, also, to approach your signage needs and our solution to them with free vision: moving forward in your own business often depends on cleverly exceeding market norms and the levels the competition expects of you. Ask questions of the project. International pioneers are consistently blue-sky thinkers. So we recognise that we do everything we can to encourage both our own staff and our clients to approach each new project with a fresh, questioning and open mind. Art and science advances over hundreds of years through individuals who imagine ‘outside the box’. We like to think we are drawn from the same source. As a company, we’ve built our entire managerial philosophy around advanced technological procedures, blended with creativity and simplicity. We lead the market, and maintain our place at the forefront of the industry by consistent commitment to research and development. You are welcome to visit us and see for yourself how our systems can provide you with total flexibility, whether you are an individual architect or designer, or a large corporation. We are fully aware that, whether large or small, our clients no longer wish to invest tens of thousands of dollars in development programmers and technical processing research for themselves. They now prefer to depend much more on independent signage companies such as ourselves, to unearth greener, more technologically advanced and more cost-effective ways to satisfy market demands, alongside high levels of design, creativity and state-of-the-art manufacturing. In recent years, through our connections to the world’s largest market in the US, Mirtec has achieved renown amongst designers, and indeed, within many principal signage companies, who look to us to further the tradition we have established in regular product innovation. In fact, today, Mirtec is admired throughout the industry for formulating an entire new generation of highly-respected products. Understandably, our clients seek success in the market-place, and as such, we constantly ask of them “What do you really need in order to do your job better?” in our meetings with leading designers from the U.S.A, Europe and Israel. Many of these clients say they have never been asked for their true needs before. Their response therefore is simple: “We require modular systems on which we can build a platform to establish our creativity and our point of difference”. So, in our role as creative consultants and prior to the manufacturing process, we approach each specification often from unconventional perspectives, finding unique solutions and previously improbable ways forward by challenging the status quo. 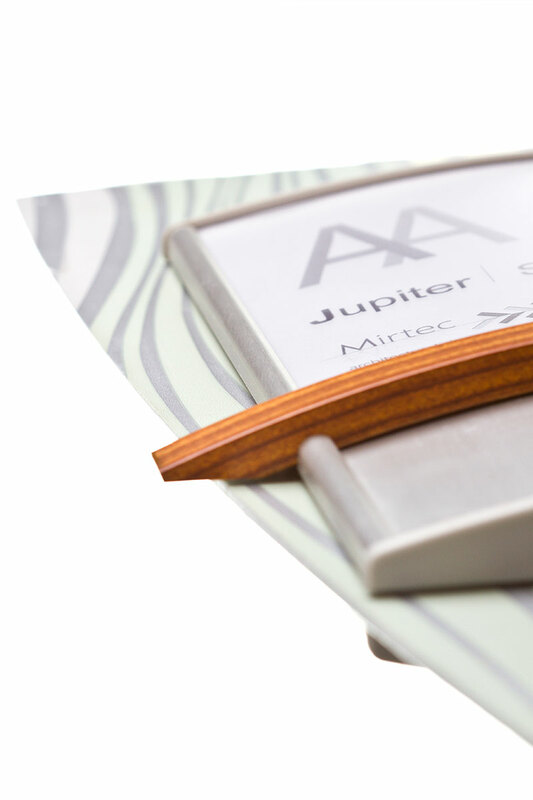 A significant number within the Mirtec range of products is patent-protected. As a result, and as a consequence of the subsequent success of our existing lines, we’ve built a major business enterprise with solid in-roads into the market-place. By maintaining operational efficiency in manufacturing, enhanced raw material quality, and a range broad enough to satisfy the general and specific creative needs of architects and designers, we can now add greater value to the client’s application than can be found in traditional signage solutions on the market.